In a letter addressed to the Hungarian Civil Liberties Union (HCLU) in April of last year, journalist Dániel Kacsoh requested a copy of very detailed information regarding this non-government organization (NGO)’s financial activities. Kacsoh, who at the time worked for a state media newspaper, Magyar Hírlap, was essentially demanding transparency from this NGO. And the HCLU’s response? Negative. The HCLU took this action as another attack on civil society within Hungary. In June 2017, Prime Minister and leader of the Fidesz party, Viktor Orbán, drafted a new revision of a law that targets NGOs within the country. This law, which will be voted on in parliament following the upcoming elections, is being propagated as a call for transparency, a way of curbing immigration and a defense against the political influence of Brussels. However, the implications of these attacks on NGOs have the potential for more serious consequences for the state of Hungary’s democracy. What is the Anti-NGO Law? Under the official name ‘Transparency of Organizations Receiving Foreign Funds’, this law has been more popularly called the ‘Anti-NGO Law’. It would require that NGOs receiving approximately €24.000 annually from donors abroad (not including EU funding) must register as an organization that receives foreign funds. One of the new campaign photos posted in Budapest. The sign translates to ‘Stop Rancor’. 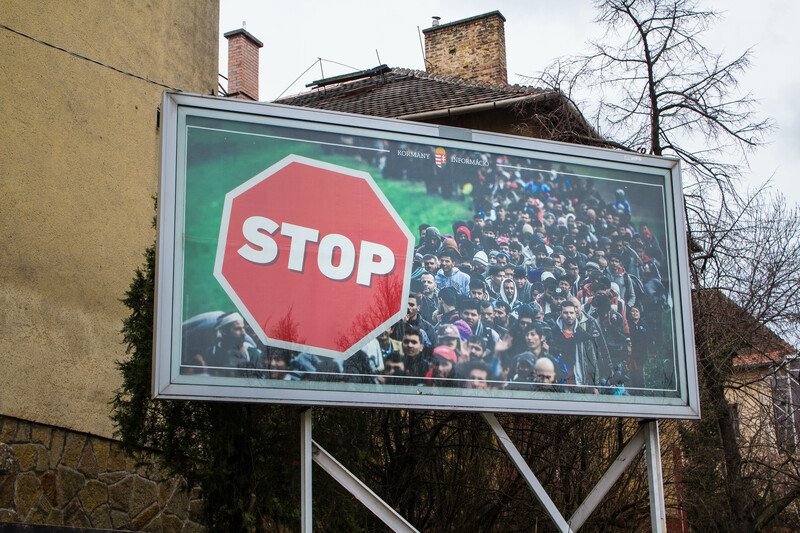 The Fidesz party often paints a negative picture of migrants using methods like advertisements such as these. Then, to continue operation, they would have to apply for a license. The discretionary power of which NGOs get these licenses would belong to the Ministry of Interior. Furthermore, a 25% tax would be imposed on any of the funding given to these organizations. If put into effect, any of the work NGOs do with migrants will be banned on the grounds of “national security”. Currently, some of the ways Hungarian NGOs help migrants is by offering legal aid, distributing leaflets and doing advocacy work. Áron Demeter of Amnesty International. Áron Demeter, advocacy and media manager of Amnesty International Hungary, points out that the work NGOs do is completely legal, which raises the question of the necessity of a license to operate. However, putting “foreign” in the description of these NGOs can be seen as a tactical method that the government uses, rather than a legal necessity. Since much of the support the Fidesz party gains is by using nationalistic rhetoric, it makes more sense to the see this law as a political tool. Discrediting NGOs that are critical of the government is one of the ways Orbán can silence opposition. Hungary’s Anti-NGO law can be seen as eerily similar to Russia’s “Foreign Agent” law that was enacted in November 2012. Since then, NGO activities in Russia have been made near impossible, and indeed, many have been shut down. Orbán has often been criticized for his admiration of and close ties with Russian President Vladimir Putin. If imitation really is the sincerest form of flattery, Putin must be blushing. The Fidesz party’s demand, that NGOs be more transparent in Hungary, can be seen as a smart and cunning move given the wider debate on how much information NGOs should be sharing with the public. Yet, this argument necessarily falls on itself. George Soros is a Hungarian billionaire and philanthropist who cooperates with EU institutions in Brussels and is often targeted by Orbán’s anti-Brussels campaign because of it. The Fidesz party criticizes Soros for bringing in a Western influence by funding many of these NGOs. Clearly, these organizations are providing enough transparency for the government to know Soros is funding them. A Fidesz campaign billboard in Budapest. This was also the same photo the United Kingdom Independence Party used during the Brexit campaign. This photo alternates with the photo below. George Soros surrounded by opposition candidates. The text roughly translates to ‘Stop Soros’s Candidates’ followed by the date of the elections, April 8th. NGOs are based on freedom of association and the freedom of expression. It is a tendency for some people to objectify these organizations, but they are fundamentally individual citizens who form communities and share their opinions as one body. This necessitates that they will not be perfect, but to quell their ability to exist means to also suppress the citizens’ voices. When the HCLU did not comply with Kacsoh’s information requests, he took the organization to court where he later lost the case. For now, NGOs in Hungary still have the ability to defend their presence and activities in court.